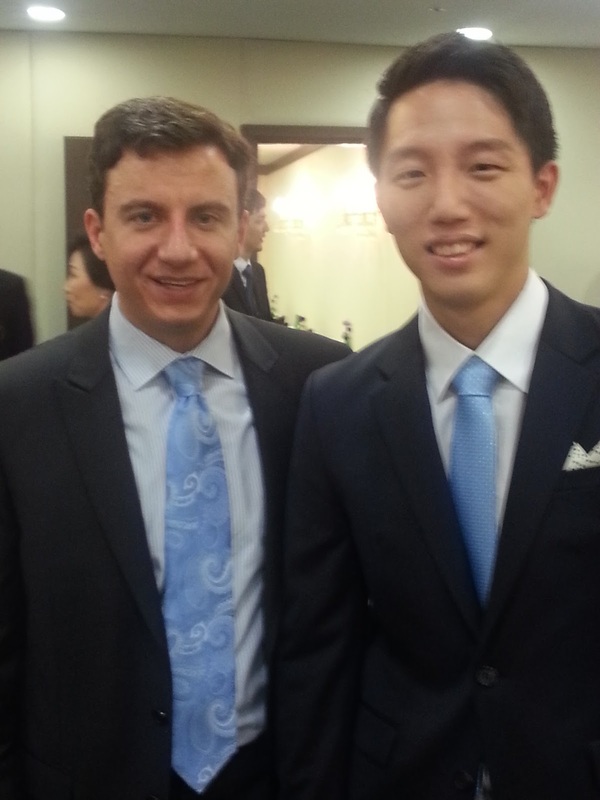 Seoul Adventure: First Korean Wedding! It was only a matter of time before I would be invited to my first Korean wedding here in Korea. In this country, weddings are a big deal – the Koreans I know seem to be attending weddings all of the time. Granted, I have missed several weddings in the USA since moving to Korea and had I stayed in my home country I probably would have been wedding-hopping on many weekends as well. However, Koreans take this to a higher level...their weddings are known for having a ton of attendees. Hence I was excited to see what all the fuss was about when I received an invite to my first Korean wedding from my friend Hyungjun, who I had worked with previously in the US. Hyungjun had introduced me to his fiance in January at a BBQ restaurant and she seemed like a great gal, so I was excited for my friend. I'm sure Hyungjun was even more excited, as he and his fiance have lived apart for two years: she in California and he in Korea where he has been completing his compulsory two-year military service. Make sure to bring money in an envelope, which will be collected at the wedding hall. Give 50,000 Korean won for regular weddings, and 100,000 won for closer friends. Make sure to get into the photo at the end to show you were there! Last Saturday afternoon, I put on a suit and hailed a taxi in my neighborhood. When the driver dropped me off at a nondescript office building in Gangnam, I thought maybe I was at the wrong place. But when I walked inside I saw several Koreans of all ages in suits and found a video display with my friend's name on it in Korean text. He was the 5:00 wedding that day...and there were also weddings at 4pm and 6pm. This wedding hall was like an assembly line! Up a couple floors and I found Hyungjun in a tuxedo and wearing white gloves. I also recognized his parents, who I had met when I visited Hyungjun's hometown during the spring. They greeted me very warmly and I immediately felt welcome, despite being the only foreigner in this wedding hall. Not knowing anyone else there, I didn't have anyone to coach me through what to do, which was a little worrying. I managed to find a desk where I signed my name into a book, and provided my envelope of money (for reference: they provide these at the wedding hall). I stood around and did some people-watching, took some photos, and wrote a little congratulatory note for the soon-to-be married. Men were mostly in suits and women in regular dresses, much like American weddings, except many of the female family members were dressed in colorful traditional hanbok outfits. A couple minutes before 5pm, the 4pm wedding was chased out of the wedding hall and we were summoned in. I took a place in the back and tried not to block the view of too many Koreans. First, the mothers walked in and did a bowing ceremony at the front, then Hyungjun, and finally the bride with her father. No best man, maid of honor, or other wedding entourage like in the US. The parents sat off on both sides of the stage in comfy-looking chairs (groom's on left, bride's on right) and a pianist sat at a piano in the back. The minister at the front, if he could be called that (this ceremony seemed entirely secular) gave a long speech to lead off the wedding. With the little Korean I know, I gather he was talking about the history of the couple and maybe giving some advice on the meaning of marriage, though I'm not really sure. Not too many people in the back seemed to care about this man's words either...they were mostly 20-somethings who seemed more interested in chatting and catching up with each other. There seemed to be no shame with coming and going from the ceremony, nor with talking at a low volume. Definitely more casual than what I am used to. A photographer was walking around snapping a ton of photos, and another young lady kept adjusting the bride's long dress to make sure it looked perfect. After the long speech, which lasted about 15 minutes, the bride and groom walked towards the bride's parents and the newly married gave a full bow to the parents. Hyungjun got down on his knees and put his head all the way to the ground. His bride was permitted to remain standing – if she knelt down, how would they have fixed her dress for the photographs! – and bow at 90 degrees. Then hugs and handshakes were exchanged, and the same process was repeated on the other side of the stage with Hyungjun's parents. Finally, the couple was declared husband and wife, I think (or something to that effect in Korean). Total time: 25 minutes. Now the photo time, and this is where my stress bells went off. I had been told, "Make sure you get in the photo," but no one had told me that there would be multiple photos! The first photo had many older people in it and this clearly looked like the family photo. The stage cleared and a bunch of younger-looking people crashed the stage for the second photo, which I thought must be the friends' photo. I smiled and walked off the stage, but then a third group assembled on stage for a photo, and I got concerned. The guys on stage seemed closer to Hyungjun than the group I wandered on stage with. When I told my Korean teacher about this a couple days after, she laughed out loud and told me that I had crashed the "distant relatives" photo!! My, will I look like a goofy foreigner in that one! At 5:50pm, everyone was chased out of the hall and we wandered upstairs for food. We were served galbitang, a beef short-rib stew, and a wide variety of Korean side dishes appeared on the table. Wedding hall staff flew around the room throwing food on tables and everyone was eating very quickly. Seating was unassigned so I stumbled down at a table with Hyungjun's middle school friends. I was able to communicate with them in broken Korean and a little English, and they were amused with the foreigner trying all of the Korean side dishes (most of which I have already eaten in Korea). This group clearly does not get to see each other much so they were busy catching up. I sat and ate quietly. By about 6:45, food time was over, the wedding party had made their way around the room to shake hands and take pictures, and we were done – time to go home! No dancing, no speeches, nothing more. Clearly I had been impressed by the speed of all this and the assembly-line manner we were whisked around the wedding hall. It all was very much fitting with Korea's palli palli ("hurry up!") culture. Now I understand how some Koreans can attend two weddings in one day! The parent worship was impressive and the gift-giving far simpler than trying to decide what someone would like off of his wedding registry. However, the whole ceremony felt rather informal compared with American weddings, and given the amount of importance that Koreans place upon traditional marriage I am a little surprised that they don't take more time to savor these events. You’re right that the usual ceremony is more hurried than a western wedding, but still formal, organized and comes with an extravagant festivity. I’m glad you’re impressed with your first wedding experience. I’m sure there’ll be more invitations to come in the future. Thanks for sharing your experience!